Bacteria and other microorganisms can be found in almost any process medium, from cooling water to crude oil. These organisms can lead to the formation of biofilm which can have a severely negative impact on plant operations. Biofilm is a serious threat with financial, environmental, and health & safety implications. Biofilm formation can greatly reduce the efficiency of systems such as heat exchangers through biofouling. It may also lead to microbiologically influenced corrosion (MIC) which can cause physical damage to piping and equipment, resulting in leaks and premature failures. These risks make it essential to monitor for biofilm formation in your system. Metal Samples offers the Biofilm Coupon to monitor for biofilm formation in piping and plant equipment. 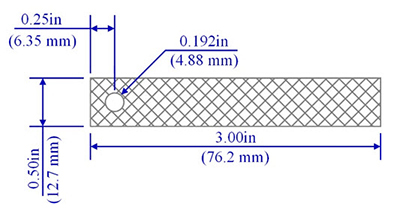 The biofilm coupon is constructed from a stainless steel mesh which provides an ideal surface for the growth of biofilm, while resisting corrosion. This allows the biofilm, if present, to be cultured for quantification and identification. The biofilm coupon is manufactured to the same size as our common weight-loss corrosion coupons, which allows it to be mounted using our standard coupon holders. Its small size allows it to be installed in almost any access point.